Under a $20 million Materials Research Science and Engineering Center grant, Brandeis physicists are creating “active” matter that could one day animate self-healing artificial organs, drug-delivering nanobots and self-mending clothes. Physics professor Seth Fraden, PhD’87, ticks off a list of potential applications of his research: self-mending clothing, self-healing artificial organs, nanobots that travel through the bloodstream to wipe out cancer cells, cyborgs that move with the agility and grace of human beings. Fraden and his frequent collaborator, physicist Zvonimir Dogic ’95, PhD’01, study “soft matter” — compounds like gels, liquid crystals, foams and polymers that exist somewhere between a liquid and a solid state. 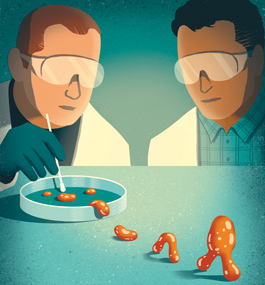 What’s unusual about their research is their use of cellular components to create soft matter. Put these two elements together — biological molecules and squishy, inanimate materials — and you easily wind up in the realm of science fiction. In 2008, Brandeis joined the ranks of Harvard, Yale, MIT and 17 other major research universities that are part of a long-term effort by the National Science Foundation (NSF) to develop revolutionary new types of machines and materials. The NSF, which designated each of these universities a Materials Research Science and Engineering Center (MRSEC), awarded Brandeis a $20 million 12-year grant. MRSEC labs focus on active matter, which is composed of individual agents, each operating independently but also coordinating on a large scale. Bacteria, cancer cells, flocks of birds, swarms of insects and herds of mammals are all examples of active matter — every member of the group is autonomous yet synchronized with all the others. 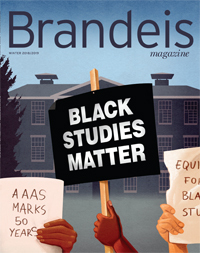 The big push to understand active matter, an effort that is only two decades old, plays to one of Brandeis’ greatest strengths — its interdisciplinary approach within the sciences. Some 16 Brandeis biologists and physicists work side by side as part of MRSEC. Dogic and Fraden have emerged as pioneers in active-matter research, publishing papers in such prestigious journals as Nature and Science. It helps that they have known each other since Dogic was Fraden’s grad student at Brandeis. Research in active matter won’t enable us to create life, just build inventions that look a lot like it. These inventions will be self-powered, won’t need human direction or effort to operate, and will be able to morph into different shapes and patterns. What took evolution millions of years to perfect, we’ll be able to whip up in a few hours in a test tube and harness for the benefit of humankind. For almost a decade, Dogic’s and Fraden’s graduate students have been going to a small slaughterhouse outside Boston several times a month. It’s primarily a source of meat for local butchers, so, initially, the students’ request was highly unusual. They wanted a cow’s brain. “At first, no one knew what to charge us,” says Stephen DeCamp, PhD’16, who worked with Dogic from 2010-16 and is now a postdoc at Harvard. “They just sort of made up a price.” The grad students were given a brain scooped out of a severed skull. They put the organ in a plastic bag, placed it in an ice-filled cooler to keep it fresh and raced back to Waltham. Cow neurons are rich in microtubules, hollow cylindrical rods that form the cytoskeleton, or scaffolding, of cells. In the lab, Dogic, Fraden and their staff members run the brain through a blender and a centrifuge, purifying the solution so the microtubules can be extracted. 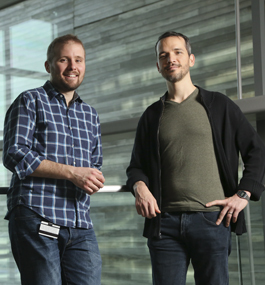 In the late 2000s, when he was searching for a dissertation topic in physics, Tim Sanchez, PhD’12, asked Dogic if he could help him with his microtubules work, then in its earliest stages. Sanchez majored in physics at New College of Florida, in Sarasota, and had no experience in performing biology experiments in a lab. Dogic suggested a raft of topics. Sanchez chose one of the hardest, a decision he soon came to rue. It was failure after failure. “How was work?” his wife would ask when he came home at night. “Don’t ask,” Sanchez would say. This went on for several months. As part of their experiments, Dogic and Sanchez put microtubules in a watery solution and added a cellular protein called kinesin. The vast and sprawling lattice of microtubules that gives the cell shape also acts as its highway system. Kinesin travels these roads to deliver much-needed nutrients, genetic information and other materials around the cell. A kinesin molecule looks like a blob with a short pair of legs. It literally walks along the surface of the microtubules, lurching forward step by step. Kinesin gets its energy from a molecule called adenosine triphosphate (ATP). Every step forward requires burning through an ATP molecule. It’s actually an incredibly efficient process. About 2 ounces of ATP, recycled constantly, can power the human body for a day. Dogic — who grew up in Croatia, came to the U.S. as a high-school exchange student and stayed — encourages experimentation in his lab. His mentees sometimes feel like kids with a new chemistry set, throwing together compounds to see what happens. In 2010, Dogic advised Sanchez to take the mixture of microtubules, kinesin and ATP he’d been studying fruitlessly and throw in polyethylene glycol (PEG), a lubricious polymer often used in laxatives, which causes microtubules to bundle together. At his computer, Sanchez watched a time-lapse video of the biological components interacting. Most of what he saw he’d seen many times before — flickering microtubule rods moving around and changing directions. But on the periphery of the microscope slide was something he’d never seen before. There were shapes that looked like short, slowly undulating tails. Sanchez walked down the hall to fetch Dogic, who was also stunned by what he saw. PEG had surrounded the microtubules, forcing them to gather together into bundles. They were now behaving like cilia, the hair-like structures that extend from the surface of cells. The whip-like beating of cilia expels mucus from our airways, for instance. Flagella, longer cilia, propel sperm. The cilia manufactured by Sanchez were not real cilia. The cilia in our body are made from 650 proteins; Sanchez’s were made from two. They also beat more slowly than real cilia. No one could use them to build cellular life-forms in a test tube. But one day they might be part of a drug-delivery system, used to precisely direct medicine to the right target. Dogic’s and Fraden’s labs soon began another set of experiments involving microtubules. Sanchez had achieved his results by trapping the micro­tubules along the outer edge of an air bubble. This suggested it didn’t just matter what compounds were used; the container in which they were placed mattered, too. This makes sense at an intuitive level. Microtubules, kinesin and ATP evolved to function inside the confines of a cell. The cilia had appeared on the edge of the air bubble, which seemed to indicate that something about the boundary’s shape and size influenced the cellular materials’ behavior. The researchers enclosed the microtubule-kinesin-ATP mixture in a droplet of oil. A video of the reaction showed two microtubules aligned parallel to each other. A kinesin molecule then came between them, connecting them like a tie between rail tracks. The top of the kinesin pushed in one direction while the bottom pushed the opposite way. The micro­tubules slid away from each other, and the structure broke apart. But the microtubules didn’t remain free-floating for long. New kinesin came along and bound each to a new partner. All this movement was happening at the most microscopic level. Zoom out, though, and you could see a massive, relentless swirl of activity inside the oil droplet. “Whirlpools in a turbulent river” is how Dogic describes it. The patterns and behavior were entirely unexpected. No one had ever observed how these biological agents behaved en masse outside the cell. The next set of experiments Dogic’s and Fraden’s labs performed involved a container shaped like a doughnut. As they changed the height and width of the doughnut, Dogic and Fraden discovered they could control the flow of the microtubules. In fact, a very specific ratio of container height to container width resulted in a “coherent flow” — all the contents inside the doughnut moving in the same direction. You don’t even need a doughnut-shaped container, they found. A tubular container with side openings at the right height and width created coherent flow as well. Then Dogic and Fraden, joined by postdoc Kun-ta Wu, placed the microtubule solution on a flat surface. Wu didn’t apply pressure or tilt the container. The solution simply started flowing. Even liquids need gravity to get moving. This one didn’t. One day, this discovery may be the basis for self-propelling liquids. Right now, to transport oil over vast distances, you have to pump it through a pipeline. Pump stations have to be built every 40 to 60 miles to generate enough force to move the fuel. But if you added the right biological materials, the oil would start flowing on its own, much the way the microtubule solution does. This is where assistant professor of physics Aparna Baskaran comes in. She figures out the underlying mathematics. Baskaran grew up in Chennai, a booming city on the Bay of Bengal in southern India. From childhood, she loved math. “It always made more sense to me than people,” she says. In college, she says, she realized that “math is just a tool.” If you want to answer the really important scientific questions, you have to go into theoretical physics. Big-name theoretical physicists tend to focus on the very small (the subatomic) or very big (the cosmic). But Baskaran realized she could gaze at a flock of starlings in the sky and confront some of the most critical unanswered questions in science. Starlings are an example of active matter. They fly in groups of thousands, sometimes tens of thousands. They are undeniably destructive birds; they wipe out crops and spread disease. But their flight patterns are choreographed beauty. They plunge and turn, cluster and spread out, swirl and arc — a veritable ballet performed at speeds of up to 40 miles per hour. High-speed collisions? They don’t happen. Even more astonishing, research and observations show that starling flocks, also called murmurations, are leaderless. Each animal coordinates its behavior on the basis of the behavior of its immediate neighbors. Neighbors are mimicked by their neighbors, who are mimicked by their neighbors, until all the members of a flock are in sync. “A local conversation leads to a global transformation,” Baskaran says. In other words, the birds don’t move together simultaneously. Their flight pattern changes one bird at a time. A change in direction is like an idea that spreads like quick­silver from one bird brain to another. Baskaran realized in grad school that physicists don’t have a good understanding of how starlings, operating in such a decentralized system, coordinate their flight patterns in such large numbers. It’s an especially key question because examples of active matter abound in nature. Microtubules are active matter. Each one grows, shrinks and moves in coordination with the others throughout the interior of the cell. Since they make up the cell’s scaffolding, the cell is able to stretch and shift shapes in response to its environment. Outside the cell, microtubules behave the same way. The patterns they form emerge in the same way as the twists and spins of a starling flock. Active matter is such a new field of study that Baskaran has only just begun to develop mathematical models to predict its activity. “The math that describes physical reality is so complicated when you’re talking about active matter,” she says. But if she and other physicists working on active matter succeed, we will be able to harness its power to organize instantaneous responses to its environment. When you cut yourself, skin cells sense the break and build a new covering. If fabric had such an ability, it could autonomously mend a tear. We might even be able to create artificial human organs that can heal themselves. Baskaran envisions a time when we can power electronics with the energy given off by bacteria. Put your iPhone under a microscope; you’ll see it swarms with E. coli. If we could control the activity of these bacteria, getting them to consume nutrients and release energy, batteries might become obsolete.